On this fine Wednesday evening, SuperPhillip Central has another new review to share with its readers. This time it's for yet another Wii U game that has made the switch to Nintendo's new console. It's time to get funky with Donkey Kong Country: Tropical Freeze for the Nintendo Switch. An infamously difficult platformer? The Kongs have an ape for that. 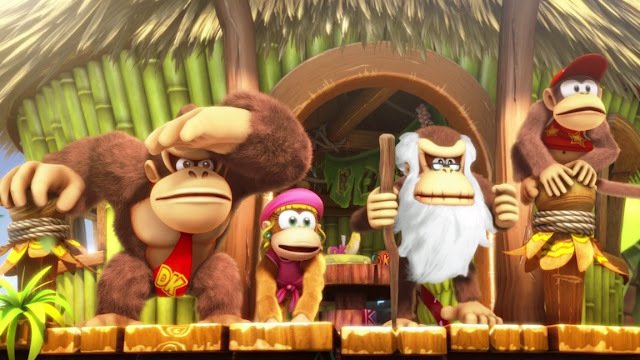 When Donkey Kong Country: Tropical Freeze originally released back in 2014, it didn't receive as much attention as it should have. This was due to the fact that the game, despite its high quality, was released on the Wii U, which as a lot of us know, wasn't exactly the greatest home console success story in Nintendo's history. Quite the opposite, actually. Now, the Kongs are back and Donkey Kong Country: Tropical Freeze gets a second shot at sales redemption with a release on the Nintendo Switch. A new group of arctic invaders has set their sights on DK Isle, the Snowmads. The leader of the bunch--which you don't know well--Lord Frederick takes a deep blow into a horn, sending a powerful chilling burst on DK Isle, not only freezing the island to its very core, but also forcibly transplanting our ape protagonists several islands over. While the Snowmads enjoy their new home in DK Isle, the Kongs, led by Donkey Kong, aim to survive the harsh islands in their path to return to and reclaim their home. The Kongs are about to get some very rude, uninvited guests to DK Isle. 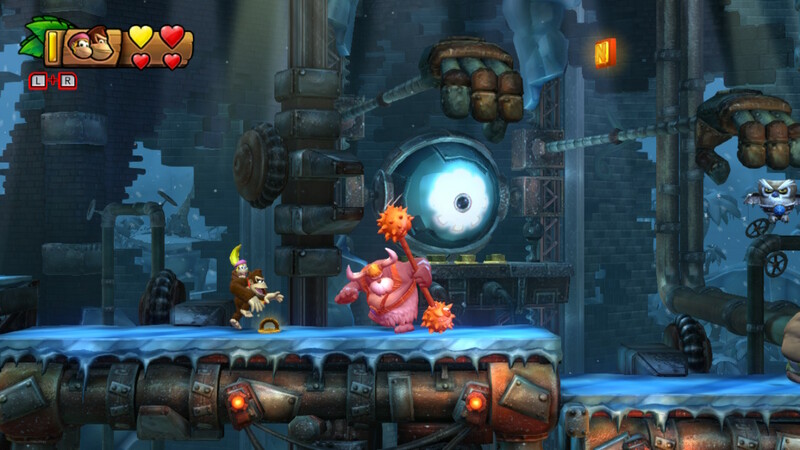 Dropping all pretense, Donkey Kong Country: Tropical Freeze is pretty much the same game from its Wii U original. It's just given an easier difficulty mode where you can play as Funky Kong, sharper visuals, and less than cool, a $60 price tag ($10 more than what was offered on the Wii U). 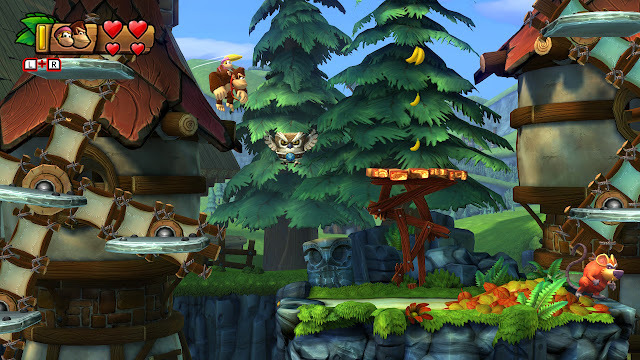 Regardless, pretty much being the same game from the oft overlooked 2014 game is a positive thing in the sense that Tropical Freeze remains a fantastic 2D platformer, one of the best ever created. Retro Studios managed to put forth a series of levels that are masterful from start to finish. 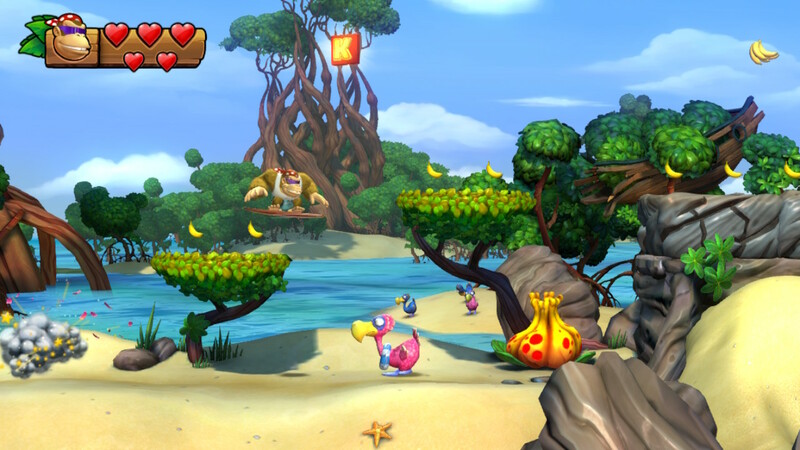 While other 2D platformers focus on one mechanic and spread it out in a given level (looking at you, Mario, but you know I still love you), Tropical Freeze routinely throws in myriad mechanics and level gimmicks that tie the level together into one cohesive package. Let's take level 5-A, Beehive Brawl, as an example. This level's primary theme that ties everything together is that of bees. In the level, you're grabbing hold of swinging hives held by honey, doing battle with bees, entering a behemoth-sized beehive while jumping on platforms pouring downward from a waterfalls of honey, and even hitching a ride by grabbing onto the cargo held by a moving train of bees to progress through the level. In a game like New Super Mario Bros., only one of these level mechanics would be expanded upon. 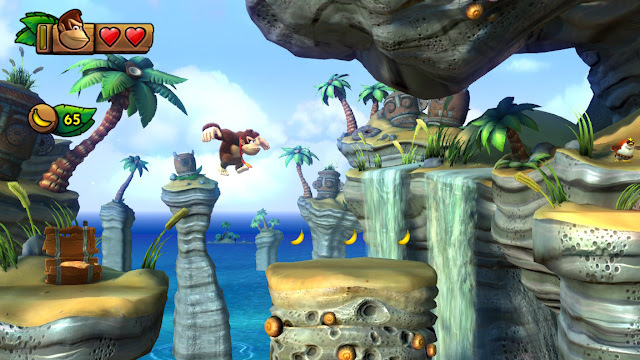 In Donkey Kong Country: Tropical Freeze, you're seeing multiple mechanics show up all centered around the theme of the level. It's ingenuous design, and I marveled every time a new stage element presented itself. 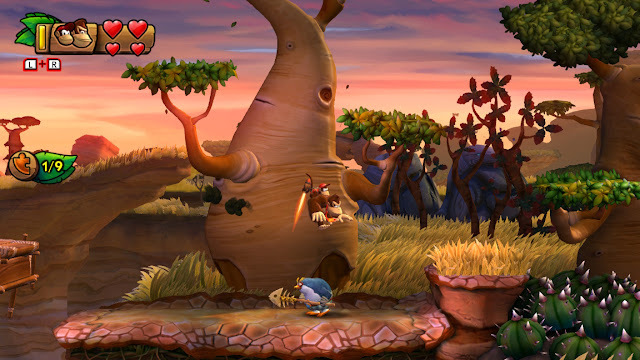 In Grassland Groove, even the trees bob and sway to the awesome music. What can you say about levels like one with platforming inside a raging twister, complete with enemies and hazards being blown in your path for you to avoid; or a level that feature jumping and rolling along the grasslands and savanna as the trees swing and sway in time with the music; or one that has you riding a mine cart as a giant saw blade chases you, carving up wood in the process and having the pieces slam down on top of the track for you to either jump off of or over; and just one more example, a level that has you climbing up platforms caught in the middle of an avalanche? You can say a lot, and all of it is astoundingly positive. 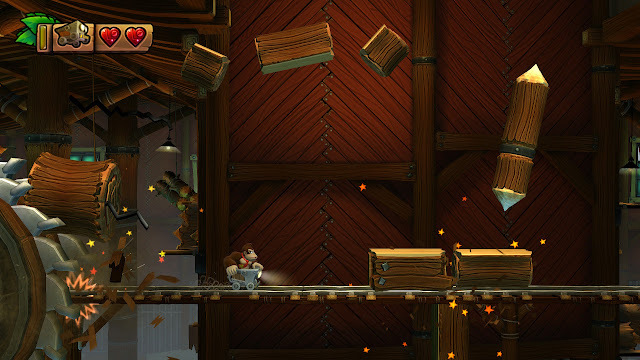 In Sawmill Thrill, the pursuing saw blade sends wooden objects and obstacles slamming down onto the track. 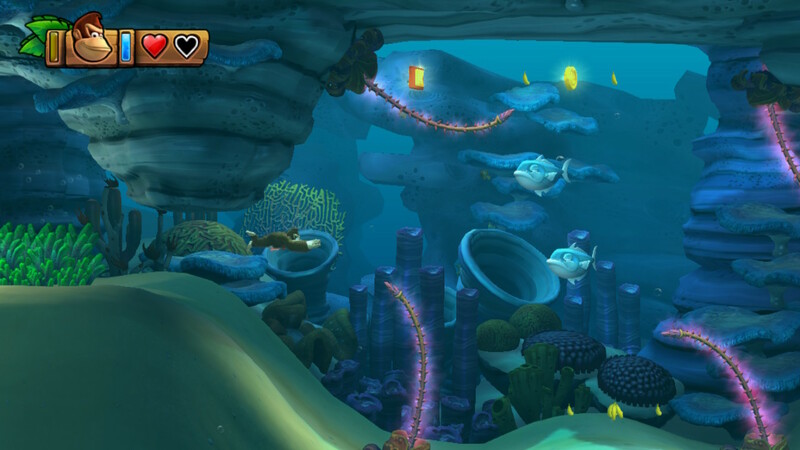 In addition to traditional platforming levels, other types of levels are included in Tropical Freeze. I mentioned mine cart levels, but there are also rocket barrel as well as underwater levels. The latter surprised me tremendously at how graceful a heavy ape can actually swim. While I did occasionally and accidentally run into enemies or hazards while swimming with the Kongs, these moments seldom occurred. Meanwhile, the rocket barrel levels are fierce tests of control and applying enough hits of the jump button to keep the rocket soaring while carefully maneuvering around obstacles in the process. These levels that stray from the typical running, rolling, jumping and ground pounding of Tropical Freeze are welcome inclusions that keep the adventure fresh and don't feel out of place. Careful, DK--you can go swimming with the fishes, just don't go sleeping with the fishes! The levels themselves feature a lot to do in them. Collect the KONG letters in each level in a world opens up a bonus temple level in that world, featuring the most challenging platforming trials in the entire game. Meanwhile, there are cleverly placed puzzle pieces found in well hidden sections of level and in bonus rooms that unlock concept art and images in the Extras menu. Some levels even have secret exits that lead to new levels. Though, it must be said that the bonus rooms are nowhere near as top-tier as what was seen in Donkey Kong Country 2 and 3. These are much too basic in Tropical Freeze and repeat themselves often. Additionally, secret exits are usually placed near the end of levels, meaning that you have to go through a level twice almost the whole way through just to unlock paths to two levels. A bit annoying, but not a deal-breaker. There's no "I" in "Kongs", so try out co-op with a buddy sometime! What was annoying for some players and critics of Donkey Kong Country: Tropical Freeze was the game's relentless difficulty. It's important to note, however, that the challenge posed in the game was never unfair to the player. Your mileage, of course, may vary, but for some, Tropical Freeze was a game that beat them into submission with its arduous levels and perilous platforming challenges. Thankfully, Nintendo and Retro Studios have a mode for that: Funky Mode. Funky should be your main monkey if you're feeling the pain from Tropical Freeze's Original Mode. Funky Mode is perfect for beginners or those who want a far more relaxing time of Tropical Freeze, as it allows players to control the double-jumping, slow-hovering, five-hearts-of-health-having, spike-walking, infinite-underwater-air-breathing Funky Kong. Generally you can only use items prior to the start of a level, but Funky Mode allows you to use them mid-level. Furthermore, in Original Mode, if you collect a KONG letter and die before hitting a checkpoint, you have to recollect that letter your next life. In Funky Mode, you get to keep any KONG letters you've collected even if you were to perish after... but perish that thought instead. You'll be Funky, the main monkey, so you'll be too awesome to lose a life! That said, if Funky isn't your choice for your main monkey, you can choose to play as Donkey Kong in Funky Mode. He'll be able to tag up with a companion (the rocket barrel-hovering Diddy, the ponytail-slinging Dixie, or the cane-hopping Cranky), and both DK and his partner will have three hearts of health each instead of the usual two. It's a touch disconcerting, though, that the default option for Tropical Freeze's Switch port is for Funky Mode. This has been mentioned by other players and critics, and I can't help but agree, but if you are a skilled player and have yet to ever play Tropical Freeze, don't let your first experience of the game be in Funky Mode. Tropical Freeze's levels were originally designed for Donkey Kong, and the genius of the level design is sorely missed when levels are tackled by Funky Kong. Funky Kong's ability to double jump, hover, and leap on spikes makes it so levels can be beaten in a way unintended by the designers. You can miss out on a lot of the complexity and cleverness of the levels and platforming challenges by playing as Funky. That's why I recommend playing Original Mode first for seasoned gamers, and for beginners to be the ones to play Funky Mode first, if they see the challenge of Original Mode too daunting at first glance. It's all fun and games until a Kong gets a black eye from a Snowmad's poker. 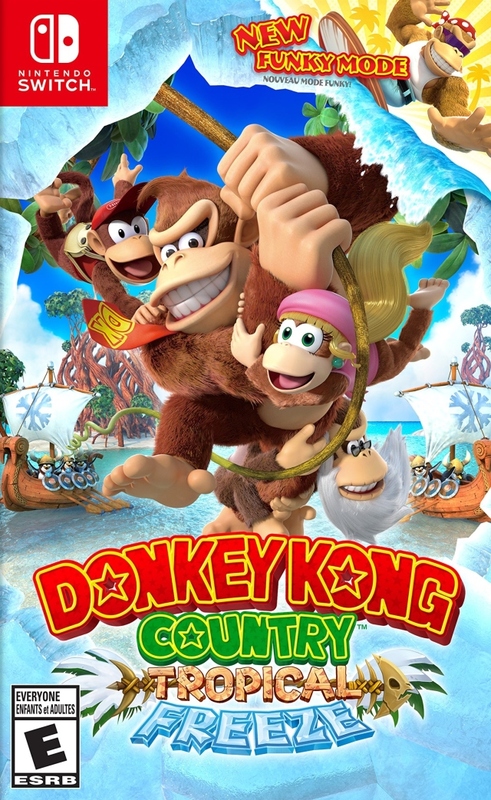 Now that all has been said, do I recommend the Switch port of Donkey Kong Country: Tropical Freeze? I say that you shouldn't even hesitate to pick Tropical Freeze up if you've never owned the Wii U game. It's a master class of stimulating platforming, expert level design, and amazing presentation values (including the sensational soundtrack provided by original DKC 1 & 2 composer David Wise). Stop reading this review right now and go out and pick it up! If you've already played Tropical Freeze on the Wii U, then you might want to pass on paying full price for the Switch port, unless you're like me and value playing the game on a more enjoyable piece of hardware than the Wii U ever was. Regardless of whether one purchases the Switch version or not, Donkey Kong Country: Tropical Freeze continues to stay at the very top of the 2D platforming heap as top banana.